Before buying any "pre-owned" vessel and particularly a marine repo or repossessed boat it's imperitive to be aware of what you're buying. Unless, your experienced with restorative work you're safer to either have the repo inspected or surveyed as a pre cautionary measure. A survey is a comprehensive inspection of a boat by an individual with expertise in evaluating the condition of boats. A good marine surveyor will evaluate many different aspects of a boat's condition providing many of the same evaluations that a home appraiser, code inspector, home inspector, or a fire marshall would perform when inspecting a home. If you're satisfied enough with what you see upon arrival your best bet is to hire a qualified marine surveyor. I emphasize qualified because anyone considering hiring a marine surveyor should be aware that there is no regulation or licensing of marine surveys. Virtually anyone can hang out a shingle and advertise their services as a marine surveyor. You should make sure that any surveyor you are considering engaging is an accredited member of the Society of Accredited Marine Surveyors (SAMS)or the National Association of Marine Surveyors (NAMS). Having a professional marine survey performed on a boat before you purchase it will give you the information you need to make an informed decision about purchase and pricing, as well as provide you with peace of mind about the vessel. Marine repo vessels or equipmment will almost always sell on an "as is bill of sale" with "no warranties express or implied" by the seller. Nonetheless a free a clean title should be furnished without exception. With that in mind you can confidently approach any marine repo source. 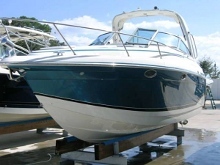 The top marine repossession resource online can be found at... BoatAuctionsDirect.com. It's simply a dedicated to the simple task of aggregating marine repos. including: fishing boats, power boats, sail boats, yachts, pontoons, ski boats, bass boats, PWC's, ATV's etc. Listings are available in every state. Some states naturally offer more than others, especially coastal states....except Arizona suprisingly. And since this website ONLY aggregates boats, pwc's, atv's, and a few other specific auction sources...every source is legitimate and valuable. Repos are often in rough condition, you can expect about 7 out of 10 to be extensive work while the others are often unbelievable buys! It's just a matter of being in the right place at the right time and having a little money (or credit) to take action.